Below is our Curriculum Overview for Spring 1. It's going to be a very exciting half term! 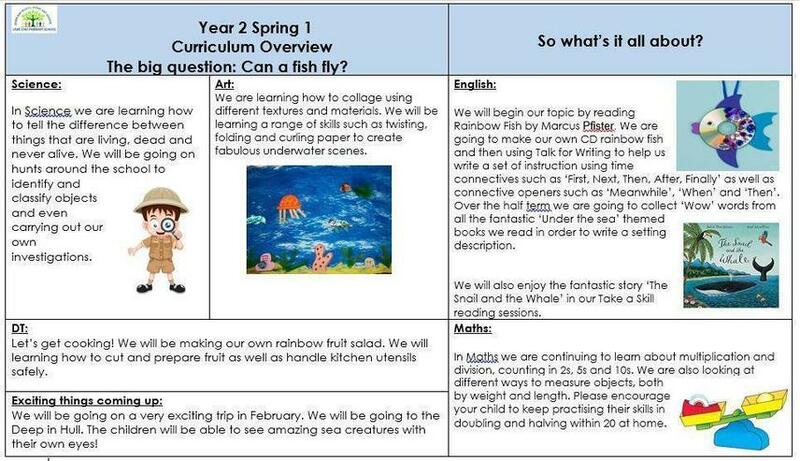 Our focus text for English this half term has been 'The Rainbow Fish.' The children started by creating their own Rainbow fish out of a CD, we then planned and wrote instructions based on how we made it. Together we innovated our instructions to 'How to catch a mermaid' and finally we invented our own set of instructions based on our under the sea topic. In science we have been comparing things which are: alive, dead or never been alive. We have been investigating how we know something is alive and what kinds of things it can do (feed, grow, breathe), we even went on a hunt around school!